This week we speak to SightlessKombat about his road to Killer status, playing while completely blind and how he levels up with friends online through XBOX One party chat. I go by @SightlessKombat online and I’m from the United Kingdom. That question can change even based on the match I’m fighting at the time you ask me. But at this current point and factoring in my whole experience with KI thus far, it would have to be Fulgore – I started with Jago and Wulf back around the end of Season 2, but then gradually realized that for various reasons they weren’t the most suitable characters for me (though I can still play them at least to a basic level in terms of Wulf and a relatively confident level in terms of Jago). Fulgore was well executed from a sound design standpoint and his ability to teleport around the screen and quickly rush in can allow me to surprise unsuspecting opponents and capitalize on their mistakes, given the opportunity, which is why I decided to take him as my current main. That and the fact you have a giant red beam you can fire out of your chest at your opponent if they make a mistake and take a large chunk of their health as a result if you capitalize on it and get a short cashout combo. That’s probably one of the most difficult questions you ask, at least in the interviews I’ve read. Mick Gordon did so much hard work with the music for the series that it’s hard to choose, though I’d say Downtown Demolition, Forbidden Archive, Forgotten Grotto, Fury’s Core, or Village of Whispers in terms of Season 2 and UltraTech Industries, Shipwreck Shore and as it was the first piece other than the main theme and character select we got to hear as a community, Tiger’s Lair for Season 1. That’s not to say the other themes are inferior, of course. Did you play the original Killer Instinct games? Killer Instinct was one of those games I heard about and never got the chance to play (in terms of the originals at any rate.) I still haven’t as of the time of writing been able to play the original games on an actual arcade cabinet. I heard about the reveal of the latest iteration of the franchise at E3 and don’t remember thinking much of it at the time. However, when Mortal Kombat X was first announced at E3 2014, I’d begun doing serious research into how Killer Instinct worked, the systems, mechanics etc as I was at the time making the decision as to what console to switch to when the time came (and pretty much had my mind set on the Xbox One, not least because of the Kinect and the voice commands that come with it). I was actually able to make sure I could download the free to play demo of Killer Instinct when my console arrived by using SmartGlass, but that didn’t stop the game taking two days or so to download. When I finally booted up the game, I realised something about it. It’s one thing to watch it, read about it or be given a demo of it by a fellow player. However, it’s a completely different experience to have your own controler in your hands and play your first few matches, just imersing yourself in the sound, the music and the quick pace of the majority of fights. What is your tournament scene like over there and have you been able to compete? Since there is, to my knowledge at least, no Killer Instinct scene in the UK, I have, up to this interview, not had the opportunity to play in an offline KI tournament though I would like to (even if it’s just for the atmosphere and to rub shoulders with players who I’ve watched on streams or YouTube videos). 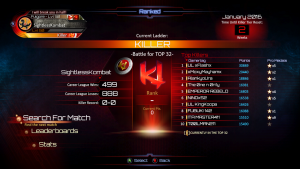 Though it’s not a tournament per say, I ran an event close to the end of last year that, with help from other community members, eventually turned into the Killer Instinct Forum Battles, where everyone just gets together and plays a few games of KI, normally with a party where we can talk and interact while we wait for invites etc. So whilst it’s not a tournament, it’s a way for people to learn from each other and fight opponents they might not regularly run into. CStyles45 even came along to guest host our stream a few weeks back, which was surprising and nerve-wracking but overall, entertaining. Do you remember your breakthrough moment competing in KI or when you simply just “Got it” in fighting games? I can’t remember a specific moment when I just “got it” in terms of KI or fighting games, but I think with Ki the community have helped – knowing that I can just ask my questions, vent my opinions on a bad match up, etc at http://forums.ultra-combo.com is comforting to say the least. I think the moment when I really took stock of my situation and gave myself an objective of sorts was when I got promoted to Gold rank, in August last year. From then on I realised that I had one task related to Killer Instinct that I wanted to complete: get the Natural Born achievement and thus my promotion to Killer status. 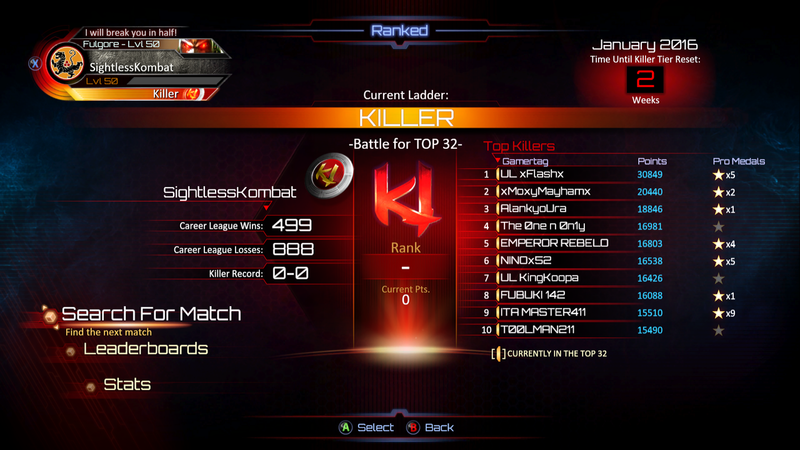 Mostly at the time it was so I could say “I have no sight, but I am a Killer rank player in Killer Instinct”. It tooke me a while, but now I have the achievement, so now I have to think of a new goal in the game. Who knows, maybe they’ll add a new mode for S3 that can give me an idea as to what that’ll be. How often do you practice or play, is it mostly online or offline with friends? I play a large amount online in exhibition matches with members of the community who I’ve learnt from and I ran the first Forum Battle and helped co-found the event as it stands, though my capacity is currently less involved than it was. If I get the chance to show people the game, I will, but those opportunities are relatively rare. If Killer Instinct’s netcode wasn’t as reliable as it is (running as it does at 90 frames per second), I might have abandoned it a while back. I enjoy the game regardless of whether I’m playing offline or online, but it’s a shame the worldwide offline scene isn’t larger to allow people to meet up for the purposes of playing and learning KI. Tell us about your disability and how fighting games have or have not been accessible to play for you. What were some of the matchups or issues that took you this long to get to that point? I have absolutely no sight whatsoever – I am totally blind. If you’re thinking “How can you play video games then?” The short answer is through the game’s audio and learning how to play the game – learning what sounds correspond to what move, in its most basic form. However, with a game like Ki it runs deeper than that. As those who play the game at a higher level are probably aware, it also comes down to reads and the “meta game” of predicting what your opponent will do. That all comes from experience, but also comes from the hard work and effort that the teams at Iron Galaxy and Microsoft Studios have put into the audio design. Small details like Jago’s Endokukens travelling across the screen before the connect (unlike Streetfighter where most of the time they simply disappear from the audio field on release and hit you unless you react quickly enough) are very much a welcome element. Admittedly, certain character’s moves sound similar but aren’t (like Sabrewulf’s Back Forward+Kick motions) but eventually, at least in my case, I came to realize I’d just have to cope with it. I Read your excited tweet to finally have made Killer Rank or Top 32. What was that process like for you. In my grind to attain Killer rank, I face a disadvantage every time I fight a human opponent who isn’t visually impaired, namely that they can see my animations. Since most people play Killer instinct as a visual game (they break based on strengths, they can see when I’m blocking high or low, they can see when I’m still in the air even if in the heat of the action I’ve thought I’ve landed), they can (unknowingly or otherwise) capitalize on that and it made my battle from gold to Killer that much more difficult. Moreover, there’s a further element to the grind most might also overlook: the fact that I can’t see both the rank of my opponent and the current/earned amount of points. Because there’s currently no way for a person with no sight to track these variables (though I’ve suggested options for how this could be resolved), I just have to keep playing and hope that everything works out. Even getting the Natural Born achievement was a surprise, as those who were with me can attest by my reaction, which I wasn’t able to capture. Each character, whether it’s Kan-Ra, Glacius, Shadow Jago, Sadira, Aria or anyone else, comes with their own inherent set of challenges specific to those with a visual impairment. I think the story I am most proud of currently, other than my rise from qualifier to Killer, is the fact that I was partly responsible for the HUD Volume slider in the audio options menu. Towards the end of Season 2, I had been playing in ranked for a while but kept dropping combos because I couldn’t see the KV meter. I signed up on the ultra-combo.com forums and had what I now see as a rant, though somewhat justified, about this and my frustrating time with the game. Community members came together in agreement and curiosity and unbeknownst to all of us, the developers responded in kind, a few patches later, by adding in KV meter audio as well as Shadow meter and eventually Cinder’s burnout enders, in addition to making the cues for obtaining instinct a little more audible. I am now able to recommend the game to others with a visual impairment based on these factors, though I still believe more could be done to make the journey through ranked and other modes a smoother one. Here’s a video montage of my quest to get to Killer. Any advice for upcoming players in KI that might be in your similar situation? If I or others like me with disabilities can achieve Killer tier in this game, you can too. You just need to keep trying and learning from those who are willing to help you out. Just because you’ll fight players who are being frustrating in ranked with what you might consider cheap tactics, doesn’t mean you have to play like that yourself for every single match. I’ve faced players who will use the same tactics on me time and time again. However, once I get to grips with what they’re doing, I’ll try my best to counter their strategies and with the right frame of mind, you can do likewise. Also, be prepared to lose. Sound cliched and rather simplistic? That’s because losing, in games like this, can be very common at times. Be aware that if you get salty (frustrated at a loss/at the tactics that your opponent uses), sometimes you just need to cool off. Whether that’s just sitting in the main menu, or turning off your console entirely and putting the game down for a day or two, it’s up to you. Just find what works for you and go with it. If players fight you regularly in exhibition etc, they’ll probably have a good idea of when you are salty. However, that doesn’t mean you can’t let them know so they are aware anyway. Sometimes exhibition is a good way to work off your salt – play casual matches with fellow players who are of a similar skill to you (you’ll normally learn this through regular matches with them) and you can always talk through strategies and counter strategies as you go to improve your game whilst being, hopefully, relatively relaxed. What did you think of the KI World Cup? I was actually in the stream chat during the S3 Rebalance demo and for most of the Kim Wu Reveal. I thought the event was a good idea, shame I couldn’t be there in person to watch it and get involved with the hype. But if it’s run again, as I believe it will be, and I get the opportunity to go, I will do my best to make it. Seems like everybody had a good time and as this game needs all the support it can get to continue driving it forward, I’m glad of that. Brandon and the rest of the team have put a lot of time and effort into making everything run as it did and it showed from what I saw – everything ran smoothly. I wasn’t able to watch everything though, but even the Season 3 exhibition matches where players had just picked up the new characters were interesting viewing. Are you excited about Season 3? Any characters you’d like to see or features in the game? I’m just waiting for S3 to come along now – as of the time of writing, we’ve been waiting for a substantial update to come along (there’s hints of a release date on the horizon so hoping information will come thick and fast). The Arbiter trailer dropped relatively recently and the speculation as to the moves we’ve seen, how they work etc is starting now. Hopefully the lack of clarification as to exactly why there are “3 stages total”, as confirmed by various individuals will eventually come and I hope that it’s worth it and wasn’t just because of the extra lighting enhancements. I’ve actually been in discussions with the audio director at MS Studios, as well as others involved with the game’s development and have been throwing tips in to better improve the game for totally blind players. A way to tell what rank your opponent is in online play (so that when you are fighting a Killer tier opponent, you aren’t surprised when the post match screen doesn’t appear and you get thrown into another round). A method of telling what difficulty and timer settings you currently have set on entering/changing options when pressing Y from the character select screen. This is crucial for some in-game achievements, or even for just playing around with the dynamic music engine in local VS mode. This one should be pretty easy to develop, theoretically at least. A way of tracking your stats based on your gamertag through an online website that could be accessed from anywhere, especially when you’re away from your console. It would allow you to see how many wins/losses you have, how many points you have in ranked, how many times you’ve broken combos, how many ultra combos you’ve done, as well as any number of character related statistics that (as far as I’m aware) are already visible in game. Finally, as for characters, I’m looking forward to trying out Kim Wu, seeing the new Rash, am curious to see what they do with Tusk and aboveall at this point in time, I am, when he drops, looking to learn Arbiter (hopefully to a high level if his play style isn’t too limiting in terms of good buttons). For those who want to interact with me and ask me questions about how I play KI (and other games as well), or train with me, you can reach me @SightlessKombat.